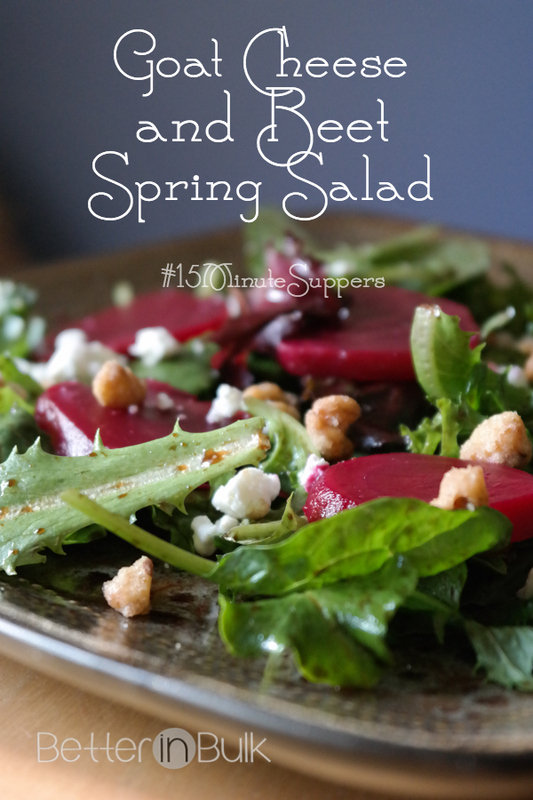 I am obsessed with this goat cheese and beet spring salad…and it’s not just about the taste (which is amazing, by the way). I am obsessed with how sinfully EASY it is to make. I ordered a salad for dinner that night, intrigued by the beets (which I LOVE on salads) and the candied walnuts (which I also love on salads). The salad I ordered at the restaurant had grilled chicken on it, but honestly the chicken was the least-impressive thing about it. 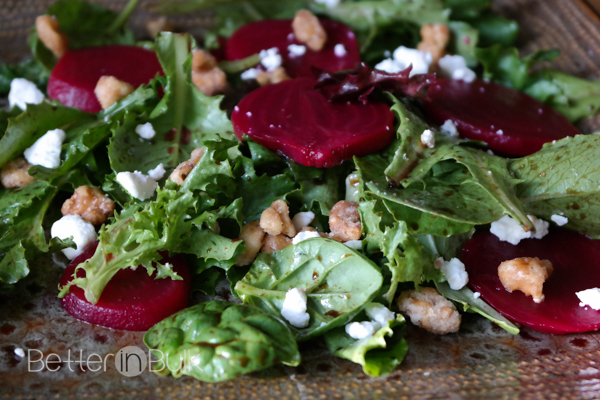 I came home determined to recreate the beet and walnut and goat cheese salad at home…and I was amazed at how easy it was to do. And what’s better, it whipped up in LESS than 15 minutes and was perfect for this week’s 15 Minute SALAD theme. Note: I calculated the Weight Watchers Points Plus value for this salad, and as long as you use approximately 1 Tablespoon of vinaigrette, 1 ounce of goat cheese, and 1/8 cup of candied walnuts, this salad would come in at 7 Points+. Of course, the greens and the beets are 0 points, so feel free to LOAD up on those. You could reduce the points of this recipe by using a reduced fat cheese, a lighter vinaigrette, or switching to a lighter nut. 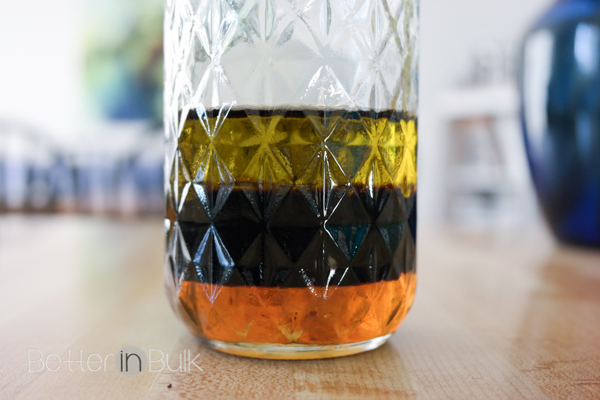 Add vinegar, olive oil, and honey to a mason jar (or another container with a lid). Secure lid and shake til combined. 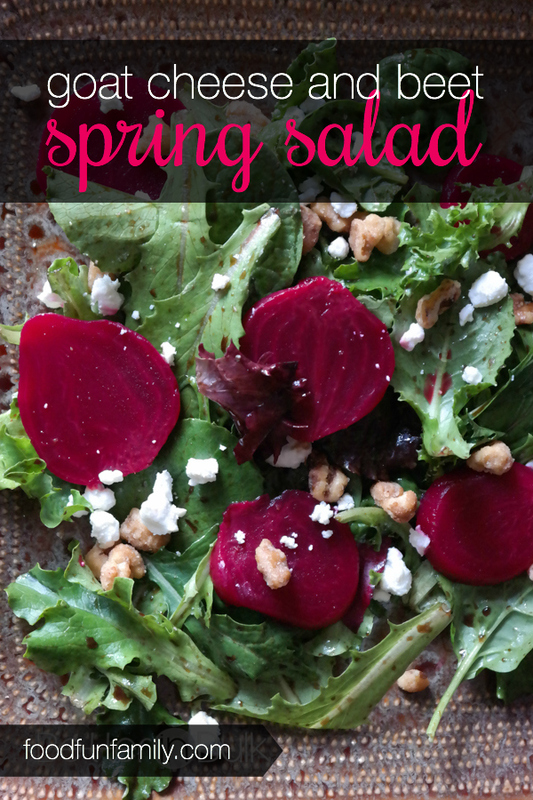 Set the salad ingredients on a plate: spring greens, sliced beets, crumbled goat cheese, and candied walnuts. Drizzle salad with vinaigrette and enjoy! OR toss greens with dressing before setting on plates. The vinaigrette is pretty basic, but if you don’t love vinaigrettes, then try another pre-made dressing. I have also made this salad with a creamy poppyseed dressing which was delicious as well…just a little sweeter than the vinaigrette. I love having vegetarian meals and this one is so delicious and a great salad to make for dinner. I love goat cheese! My goodness this looks amazing and perfect for summertime light eating thank you for sharing this one. This looks so yummy. Can’t wait to make it. I am so happy that you shared this link at #HomeMattersParty and I hope you will come back and share again. No…thank you! :) I love being able to link up recipes and crafts and see everyone else’s ideas! Love goat cheese! Thanks for sharing on the Living with Style Linky Party! Looks very tasty. 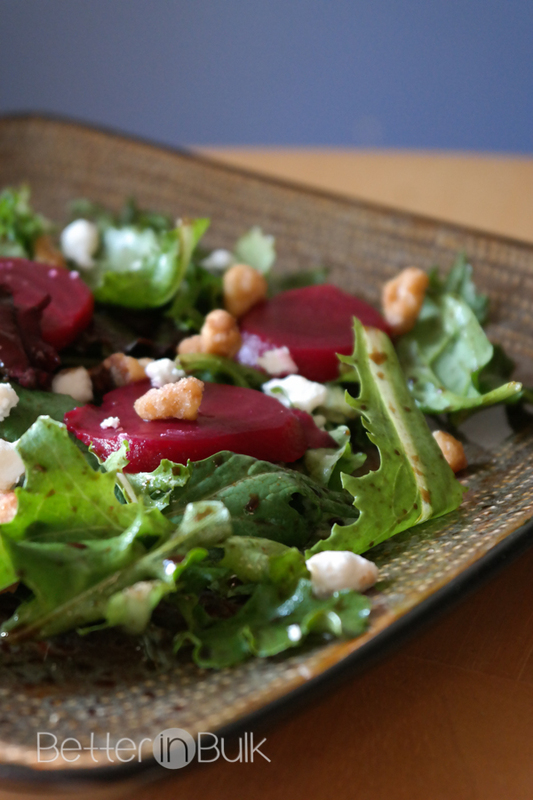 I have never tried goat cheese and beets in a salad. I can’t wait to try this recipe. This really looks very good and healthy. Not sure the kids would go for it, but I would! This looks so good! I love salad and will add this to my recipes. Thanks. This salad looks divine! I will definitely be trying this one! I love the three layer dressing. This looks amazing. Pinning it! I think this looks so good! I love beets, candied nuts and goat cheese. Looks delicious! I just got a huge bunch of beets from my CSA, and I am going to cook them and use them on salads. This salad is just beautiful! I love it when a salad looks as pretty as it tastes. I love beets and goat cheese together! This is one of my husband’s favorite types of salad. The dressing looks yummy- must try!